The GPM Sliding Caliper with Vernier Scale is based on the measurement system invented in 1631 by French mathematician Pierre Vernier. The main advantage of the this instrument is the ability to gain precise measurements of both the internal and external diameters of an object. The Vernier scale allows for a reading accuracy of 0.1 mm, by indicating exactly where a measurement lies in between two marks on the main scale. The caliper is made entirely of metal, and the main scale is engraved in millimeter intervals from 0 to 150 millimeters. The Vernier scale is engraved in 2 mm intervals, from 0 to 20 mm. On the right hand side of the caliper, the thinner, pointed jaws (with a length of 20 mm) are used for measuring smaller objects and internal diameter. On the left hand side of the caliper, the thicker, incongruent jaws (with a length of 50 mm) are used for normal size objects and external diameter. 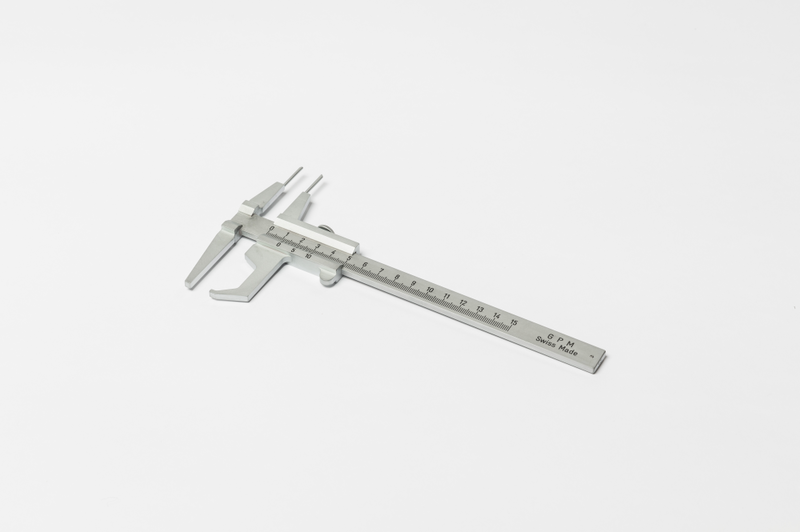 A sliding caliper is used to measure the distance between two points on a flat surface. To measure the distance between two points where one or both may be on a rounded surface, please see our range of GPM spreading calipers.